German-born exercise enthusiast Joseph H. Pilates (1880-1967), is another larger than life character in the wellness movement. Joseph as a child was frail, suffering from asthma, rickets and rheumatic fever. He overcame his physical limitations with exercise and became accomplished in many different sports; including skiing, diving and gymnastics. His new physique was so impressive that he became a model for anatomical drawings at the age of 14. Joseph moved to England in 1912. 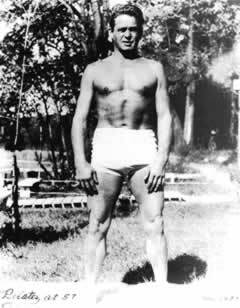 Around 1914, Joseph Pilates became a performer and boxed, at the outbreak of World War I he was placed under forced internment along with other German nationals in Lancaster, England. During his internment years, Joe refined his exercise ideas and trained other internees in his system of matwork exercises. When Joseph was moved to a different camp, he was allowed to use his methods to help injured war patients. Here, he began devising equipment to rehabilitate these men, taking springs from the beds and rigging them to create spring resistance and movement for the bedridden. Joseph originally develop his Universal Reformer and Cadillac exercise equipment so that these bedridden patients could exercise in bed. Legend has it, that when an influenza epidemic struck England in 1918, killing thousands of people, not a single one of his trainees died. "Man should bear in mind and ponder over the Greek admonition - Not Too Much, Not Too Little." --Jospeh Pilates, Your Health, 1934. Joseph Pilates brought his revolutionary method of mind-body exercising to the United States in 1926. His exercise studio in New York City caught the attention of the dance community by the 1940s because the Pilates method was particularly good at healing dancing injuries, fast. This was not difficult as the New York City Ballet was housed in the same building as his Pilates studio. Pilates spent the remainder of his life running his exercise studio in New York City. He usually functioned in his studio more as a physical therapist for injured professional dancers then as a personal trainer for the masses. He, also, continued to develop therapeutic exercise equipment to help his clients recover from their injuries. 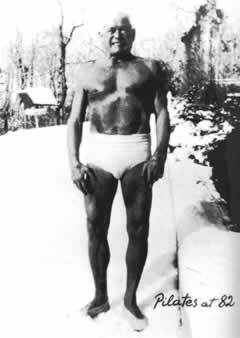 Pilates' was famous, as pictured above, for jogging around New York during the winter months while wearing only his exercise trunks. Pilates died in 1967, at the age of 87. It is widely believed that his life ended prematurely from smoke inhalation suffered from a fire in his exercise studio. Joseph Pilates was one of the first fitness trainers to advocate the mind-body connection that consisted of physical and mental conditioning. The Pilates Method combines slow, deliberate and precise movements along with concentration and breathing that particularly emphasized what he termed the 'powerhouse' the muscles of the abdomen, lower back and buttocks. Rehabilitation was an integral part of the Pilates method from the very start. Pilates "is not a fatiguing system of dull, boring, abhorred exercises repeated daily 'ad-nauseam.' Neither does it demand your joining a gymnasium nor the purchasing of expensive apparatus. You may derive all the benefits of ...[Pilates] in your own home." Joseph wrote two books, but never set up an official Pilates training program. Your Health, originally published in 1934, explains Joseph Pilates early fundamental tenets of posture, body mechanics, and correct breathing. Return to Life Through Contrology, first published in 1945, defined his concept of Pilates, what he then called Contrology, with specific advice regarding posture, body mechanics, correct breathing, spinal flexibility and physical education. But more importantly, he personally demonstrated his original 34 matwork exercises. "The science of Contrology disproves that prevalent and all-too-trite saying, 'You're only as old as you feel.' The art of Contrology proves that the only real guide to your true age lies not in years or how you THINK you feel but as you ACTUALLY are as infallibly indicated by the degree of natural and normal flexibility enjoyed by your spine throughout life." His Pilates studio on Eighth Avenue in New York City was taken over by his wife Clara until the early '70s when Romana Kryzanowska became the director of his studio. His studio is still in operation, today. Your Health, Published by Jospeh Pilates, 1934. Return to Life Through Contrology, Published by Jospeh Pilates and William John Miller, 1945. Copyright © 1999-2016, by John H. Gohde, All Rights Reserved.